Looking for a great gift or souvenir from Germany? Here are 8 German gift ideas, both cliche and quintessential, all made in Germany. 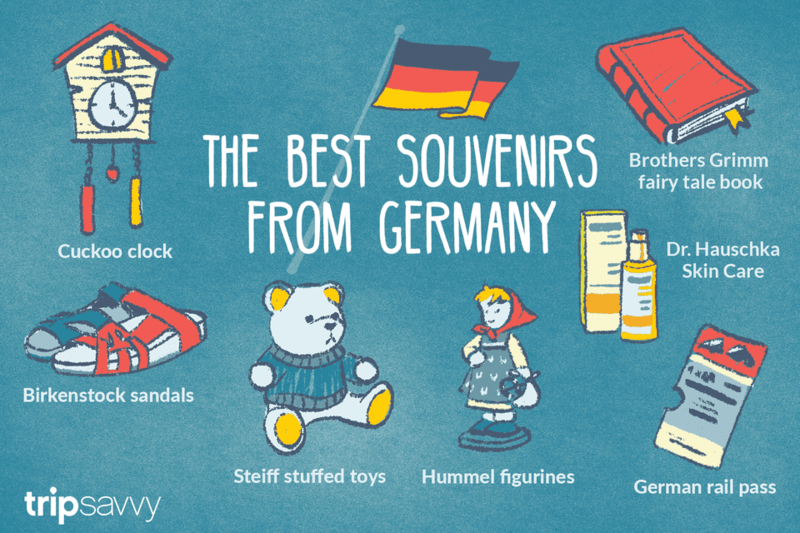 From shoes to books to toys, these quality German products will always be appreciated. The cuckoo clock is THE signature gift from Germany. These pendulum-regulated clocks originated in the Black Forest and can be identified by their intricate wood carving and cuckoo's call on the hour. You can spice this gift up by choosing a more contemporary model. The cuckoo clocks of today come in bold colors and modern designs and some are even made out of stainless steel. What German product is more well-known than the oft-maligned Birkenstock? Sure, Germans sometimes wear them with socks and they are not the hippest shoe, but they stand the test of time. These sandals have been manufactured in Germany since 1774. With their contoured cork and rubber foot bed, they conform to your feet, making them one of the most comfortable shoes on earth. And just because the Birkenstock has a long history, that does not mean it hasn't adjusted to the future. "Birks" have become more trendy and come in fresh colors like plum, stone blue, passion flower, and iridescent silver. They have also added to their traditional 2-strap style and they now come in a variety of designs - some even forgoing the traditional sandal. Also on our list of best toys made in Germany, these lovely stuffed animals from Steiff not only put a smile on children's faces, but also on those of worldwide collectors. The Steiff Teddy Bear is made only out of the finest materials, such as actual felt, mohair, and alpaca. The real bears also come with the authentic Steiff trademark, the original "button in ear" that keeps imitations at bay. Fans of the toy that find themselves in Munich should set aside time for a day trip to the factory in Giengen (about 90 miles west). Here you can play in the interactive toy museum and observe the workshops where the plush toys are still created by hand. Finish your visit by shopping at the largest Steiff shop in the world. Who can resist a shop full of teddy bears? If you want to fit in at Oktoberfest, or get in touch with your Bavarian roots, it might be time to invest in tracht (traditional Alpine wear). Lederhosen refers to the leather pants while Dirndl refers to the dress. They both come in a range of price points and qualities. You can get something cheap and fun, or high-quality and life-long. While tracht sections pop up in major department stores all over Germany during Oktoberfest, permanent stores are dotted around Bavaria. The Brothers Grimm Fairy Tales include such classics as Schneewittchen (Snow White), Aschenputtel (Cinderella), and Rotkäppchen (Little Red Riding Hood). Give this story book to a child or the young at heart. No matter what age, it is always magical to conjure up the Germany of old times with its mysterious forests, romantic castles and medieval villages. Give the gift of beauty and well-being. Women from all over the world love Dr. Hauschka's natural skin care from Germany. Dr. Hauschka follows a holistic approach to skin care and only uses sustainable, organic ingredients plus all their products are free from preservatives. A personal favorite is their rose day cream. These charming heart-shaped gingerbread cookies are ubiquitous to German festivals. Once purely southern and just for Christmas, they can now be found all over the country throughout the year. These are an inexpensive souvenir that are best for saving rather than eating. They offer sweet sayings like "Ich liebe dich" (I love you) and are quite sturdy - perfect for packing. Designed on drawings of the German nun, Maria Innocentia Hummel, every porcelain character is handcrafted. This process takes several weeks and makes every figurine unique – and definitely popular. The figures became popular in the 1930s, particularly after the end of World War II as American soldiers stationed in West Germany sent the figurines home as gifts. There is even a Hummel Museum in Illinois and you might recognize the figurine (or a hundred) from your grandmother's shelves. The German factory closed down in 2008, making these collectibles more valuable than ever. Simply called a stein in English, traditional beer mugs are made out of stoneware. Today's mugs range in material are can be pewter or porcelain or even crystal. Open-topped or hinged, they may be half or full litres. Basically, they come in any style you please and make for a colorful and useful souvenir.